No Impact Man opens at the E Street Cinema in Washington this Friday, September 25. Not long ago I took my "toodler" bike over to Falls Church to meet someone for lunch at Panera Bread. It was overcast and threatening rain, so I didn't want to leave my bike out in the open. There's a newly constructed parking garage, so I went in looking for the bike parking. I didn't find any, but as I came out I saw the rack pictured to the left. As you can see, although it has a nice little nook location, it is located under the open sky, so it was going to be rained on. Putting car parking under the open sky is not a problem except for convertibles. But all bikes are "convertibles," so we cyclists really appreciate having parking that is out of the elements if at all possible. In this case, it is possible. This is where I parked my bike instead, so it would be out of the rain. I locked it to a pipe. 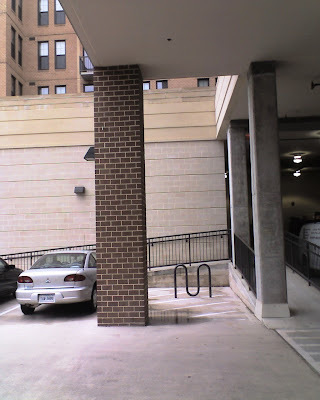 This is in "dead space" that is too small or the wrong size or shape to be used for automobile parking. All garages have dead space, and a lot of it could be used for bike parking. This seems like a natural spot for placing some racks: it's inside--out of the elements, there's plenty of room, it's near the entrance, easy to find and well lit.